Another manufacturer has thrown their hat into the Android Ice Cream Sandwich 4.0 ring. 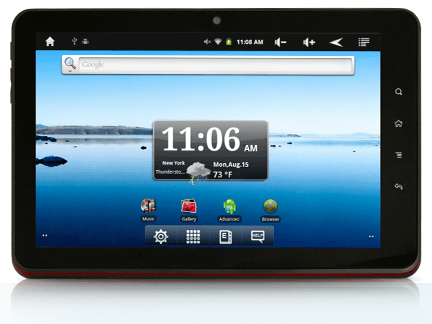 E Fun, one of the better budget makers of tablets has announced that they will be unveiling their latest offering next week at CES 2012. The new hardware is called the Elite 10 and it’s a 9.7 inch tablet that will be among the first to run Google’s next-generation version of the Android operating system. The Elite 10 will feature 1024 x 768 resolution, a Broadcom A9 dual-core 1.1 processor, Bluetooth, and HDMI. It also will have dual cameras – a 2.0 MP front-facing one, as well as a 5.0 MP rear camera, and also high definition video. Stay tuned for some shots of this new Android device that will be coming soon. The tablet itself will be available in the Spring at an MSRP of $249.99. Below is the current Android 2.3 model from E Fun (the Premium 9), which is probably an adequate hardware representation of what is coming. You can visit them by heading over to NextBookUSA. I saw that HSN was blowing out the Premium 9 for $249.99 the other day.